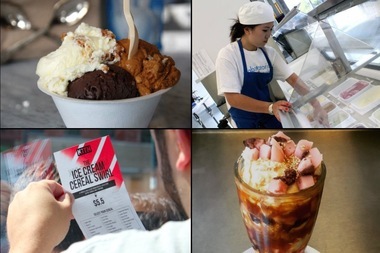 Options for ice cream in Prospect Heights include, clockwise from top left: Ample Hills, Il Laboratorio del Gelato , Butter & Scotch and Kith Treats. PROSPECT HEIGHTS — For all its five-avenue span, the ice-cream scene in Prospect Heights packs a lot of punch. There is, of course, the powerhouse on Vanderbilt Avenue, Ample Hills, and its amicable competitor on Underhill, Blue Marble (with only slightly shorter lines). But those spots aren’t the only places you can find a really good scoop around the neighborhood. ► Brooklyn Bell’s The Local, 843 Classon Ave. Since opening this shop just off Eastern Parkway in 2014, husband-and-wife team Ron and Kati Cunningham have been serving seasonal, small-batch ice cream with flavors they create themselves, like “Black Lava Caramel,” “Honey It’s Thyme,” “Sweet Potato Pie,” or “Raspberry Sorbet” (a specialty flavor made recently to commemorate Prince). The shop also carries coffee and local baked goods. ► Kith Treats, 233 Flatbush Ave.
OK, you might feel weird going to a sneaker shop for ice cream, but hear us out: the owner of Kith, a fashion shop for hip dudes, really likes cereal. So he created a “cereal bar” inside his clothing store last summer, which serves an “Ice Cream Cereal Swirl” — vanilla soft serve mixed with your choice of 23 sugary cereals, from Apple Jacks to Reese’s Puffs. ► White Tiger, 601 Vanderbilt Ave.
No, this is not a dessert spot. But this new Korean fusion restaurant from the owners of Pequena (R.I.P.) has a dessert menu with some absurdly good gelato made by the famous Lower East Side ice cream makers Il Laboratorio del Gelato. They provide a crazy list of flavors including five different fig gelatos (black mission, turkish, fresh white, fresh black and “fresh brown turkey”), mascarpone and tarragon. The sesame and cinnamon flavor comes highly recommended. ► Blue Marble, 186 Underhill Ave.
Technically the second location for Blue Marble (the first, which opened in 2007 on Atlantic Avenue in Boerum Hill, closed in 2010), this Underhill Avenue spot is the organic ice cream’s company oldest shop, serving all kinds of flavors in a cheerful and large space usually packed with locals on any weekend evening — or any day it's over 60 degrees. ► Butter & Scotch, 818 Franklin Ave. If you want your ice cream with some booze (and want to take a walk to Crown Heights on a nice summer night), stroll over to Butter & Scotch on Franklin Avenue, which has alcoholic shakes and floats on their menu, as well as regular scoops and sundaes, all made with Blue Marble ice cream. Their “DeWhopper” float sounds particularly decadent: whiskey, creme de menthe, creme de cacao and vanilla ice cream with whipped cream and chopped dark chocolate. ► Ample Hills, 623 Vanderbilt Ave.
► Honorable mention: Tom’s Restaurant, 782 Washington Ave.
It’s not exactly ice cream, but we have to ask: have you ever had an egg cream at Tom’s? If not, please do. Or, if you’re in the mood for the real shebang with your brunch, get the Belgian waffle sundae, complete with a scoop of ice cream, whipped cream and a cherry on top.